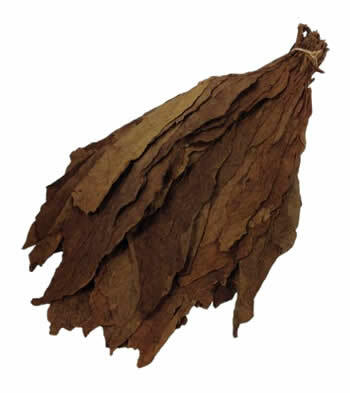 The Brazilian Habano Viso tobacco leaf arrives in a bundle for your convenience. These leaves are grown from Habano seed, but grown in Brazil. These leaves are medium to dark in color and not too thick. It has similarities to the PA Oscuro Wrapper, yet they are slightly smaller and have their own distinctive smell. 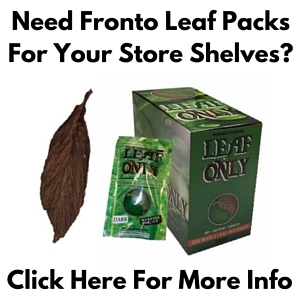 A wide variety of wholesale tobacco in the form of binders, wrappers and filler are available at Wholeaf.com. You can roll your own custom cigar by selecting your favorite leaves… but don’t be afraid to try something new and experiment with our variety of tobacco! The Brazilian Habano Viso wrapper is aged to perfection. It is also usable as a binder. 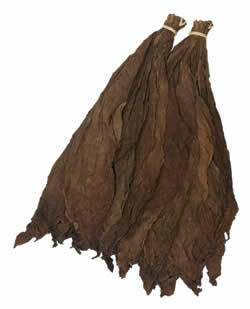 Brazilian Habano wrapper leaves are small, and have a medium to dark color. These tobacco leaves are grown from the Cuban Habano seed. 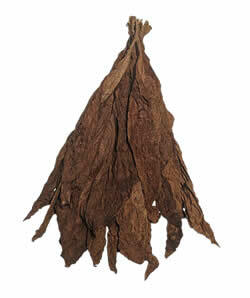 Brazilian Habano Viso leaf arrives tied in hands, as does most wrapper grade whole leaf tobacco. Interested in purchasing a quantity of Brazilian Habano Viso at the incredible prices listed below? Contact us to set up your order now.